I realized that it's already March 30!! Better post this before we're completely out of the month the holiday actually falls in! 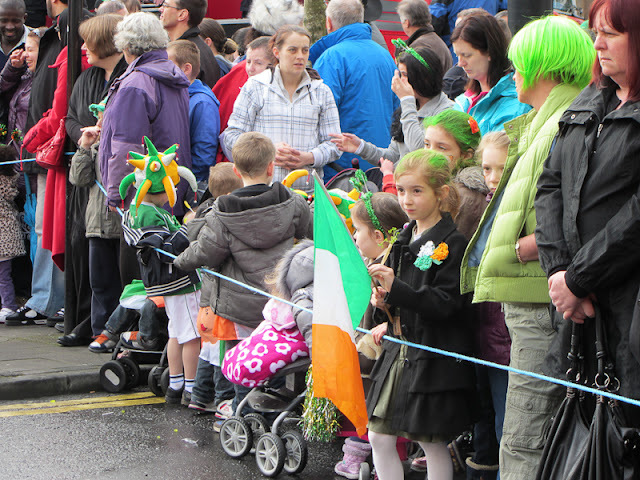 We were up and ready for the St. Patrick's Day parade in Ennis at 9:30am. We had to pack all our stuff together and be ready to check out, as our plans for the day unfortunately did not involve returning to our hotel room. Once we left at about 10, we went straight to town and found parking, miraculously enough and were able to walk around Ennis a little before finding a place on the street to watch the parade. We arrived to the street a little early and were rewarded with the perfect spot! Hooray for us! It was fun to see all the Paddy's Day spirit reflected in onlookers. 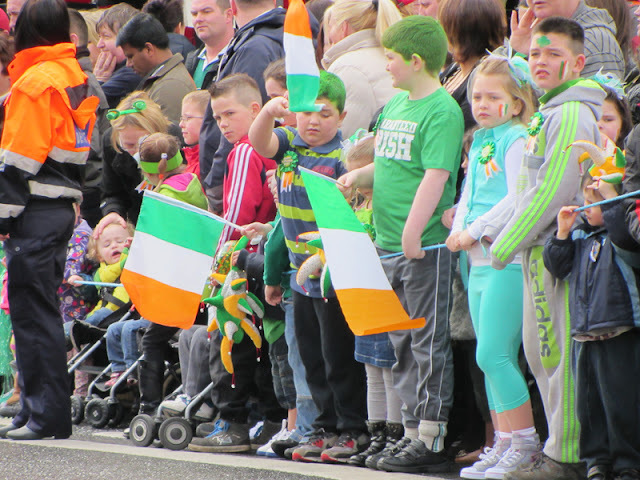 It was predicted to rain (as per Irish tradition), but just as we were waiting for the parade, the clouds broke and out came the blue skies and sun! 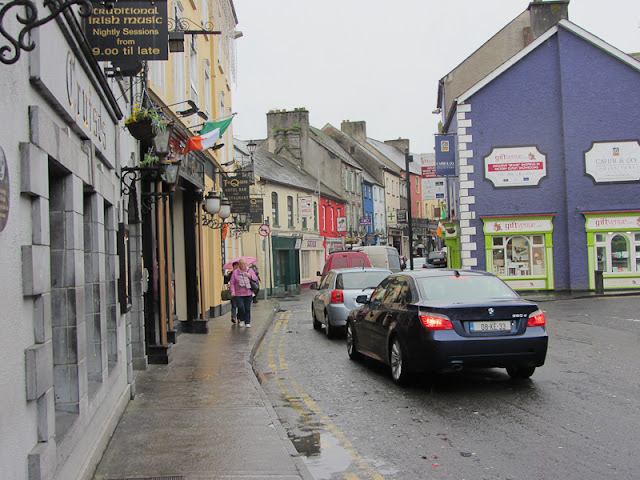 After weeks and weeks of being cooped up at home, and with a long weekend ahead of us, thanks to St. Patrick's day and a Bank Holiday, we decided to jump ship and head to Ennis, Co. Clare for a little retreat. We left home on Thursday, and headed north. The drive was good, and we had some lovely weather along the way. Once we arrived in our hotel, The Woodstock Hotel, we got settled in and went to have a dip in their pool, soak away the day in their jacuzzi, and finally to turn to pudding in their sauna. An amazing way to end the day, and start our weekend! The next morning it was raining, but we broke out our umbrella and went into town to walk around anyway. A little rain never hurt anyone. We decided on breakfast at Cafe Aroma, mainly because we were just hungry and this was the first place we came to - but I have to say that I'm very glad we stumbled upon it. Oh, Avocado... How I Love Thee. Avocados. Those funny looking fruits at the grocery store. Buttery in taste and texture, rich in nutrients and vitamins... plus that amazing delicious green color. Perfect for Saint Patrick's Day, though not custom fare on this rock in the sea, much to my chagrin. I have purchased at least 20 avocados since I have lived in Ireland and only ONE of them has been good. When I find them in the grocery store, they're either tiny (see below) and rock hard or decently sized and... you guessed it... rock hard. Usually, by the time they ripen, they're all brown and stringy inside - in other words, gross. When I lived in the states, I would buy 3-4 avocados a week and eat them in sandwiches with sprouts and a bit of mayo, on toast with a bit of salt and pepper, or my favorite way - in homemade guacamole. My best friend and I have come up with a few different recipes to make it, and we used to eat it together on the couch while watching our favorite television shows. We tried making an avocado smoothie once, but it turned out to be a failure. Those were really the only ways I had ever heard of using avocados. Enter Pinterest.